Laser class subscriptions are payable by all Laser owners - whether or not you compete in the regional and national championships. The number of `slots' that South Africa is entitled to enter at the Laser World Championships is dependent on our fleet size - judged by the no. of paid up class members. The local portion of subscriptions is used judiciously to promote the awareness and popularity of the Laser in this country. Your paid up membership of the class helps to maintain a strong, financially sound class. Such a class maintains the value of your boat. To pay your class subscription, please download the form, complete and return to S.A. 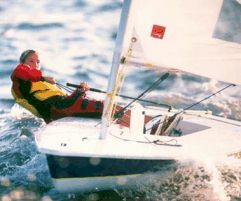 Sailing, who perform class administration on behalf of the Laser Class Association. Payment may be made via internet, subject to provision of confirmation of payment to the SAS office. Class subscriptions are due annually on the 1st July.